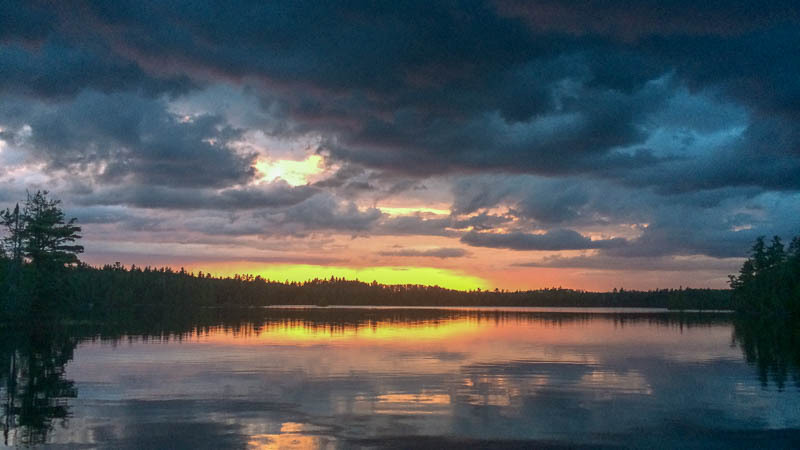 The Sawbill Lake Campground is a Superior National Forest Campground. Built on a hill above the lake, about a quarter of the sites offer a partial lake view. The entire campground is heavily wooded with white pines, red pines, spruce, balsam, birch, and aspen. Sawbill Canoe Outfitters is the concessionaire operator of this campground, and maintains a store with showers, laundry, grocery and convenience items, canoe and camping gear rental, a pay telephone, and a Verizon wireless hotspot. Although there are no water, sewer, or electrical hookups at the campsites, they can easily accommodate large motorhomes and trailers. Trash and recycling facilities are located throughout the campground. There is one dump station (with a water hose) near the Sawbill store, and it is free to use. Sites are $18 per night with a limit of 9 people per site. Half the sites can be reserved online at www.recreation.gov or by calling toll free 1-877-444-6777. The other half of the sites are available first come, first served. The campground is rarely full, and overflow areas are available. Nine people per site maximum. Quiet hours must be observed between 10 p.m. and 6 a.m. every day. Respect your neighbors: no loud music. Dogs are welcome, but must be leashed and under control at all times. One car or truck is allowed per campsite. A second car or truck is allowed for an additional $9 per night. Maximum of two cars or trucks per campsite. All vehicles must be on parking spurs. Campsite must be occupied on the first night. Campsites cannot be left unattended for more than 24 hours. Fires must be contained in the designated fire pits and supervised at all times. Put your fires dead out before leaving your site. Do not cut green or growing things. Bears love coolers. Keep your cooler out of sight in a hard sided vehicle. Leave your campsite cleaner than you found it. Remove all litter from the fire ring before leaving. Bag your garbage, place it in the dumpster, and keep the dumpster latched.